My inspection of all the collated, unsewn pages of LABYRINTH SUBLIME is steadily progressing. I estimate that I am one-third along the way toward completion. I had forgotten just how demanding this aspect of the project was for ANTARCTICA. Fortunately, I have the patience and concentration for this task of looking very carefully at page after page all day long, every day. I shall soon be taking a short break, heading home to Pat and our son Glen for Easter; and the following weekend to host our annual folk dance festival. As a “change is as good as a rest,” I will return refreshed to Friesens on May 5th to continue with the inspections of LABYRINTH SUBLIME and to oversee the printing of specific replacement pages for those that were scratched or have colour issues. Toward end of May, I anticipate having given approval to the final set of pages for each tome. As such, I’ll be working at Friesens through to seeing the shipment on its way to Felton Bookbinding in Georgetown, Ontario for hand sewing and hand binding. 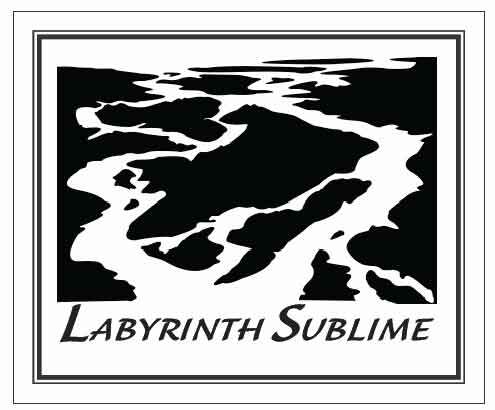 There’s much happening on several fronts for LABYRINTH SUBLIME which I will light upon below. First though, I thought to share these two photos that I took this morning on my way to Friesens. Can you believe it. After days of shrinking snowbanks, and reappearing lawns, it snowed and snowed and snowed. Flocks of song birds having so recently arrived from warmer climes, were singing loudly despite the weather. Might this be Nature’s delayed April Fool’s joke? Surely spring is around the corner! 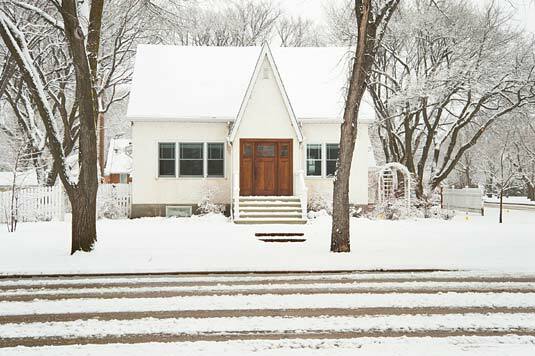 In my composition of this charming home, located within a half block of the Friesen plant, I’ve purposefully centred the wooden door, emphasizing the warmth and welcome that the home and specifically the door represents. 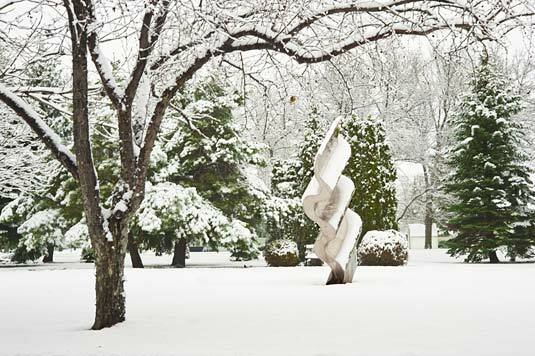 I am attracted to white on white on white — white house, white roof, white snow, white sky. The horizontal light-dark lines of the steps and the vehicle tracks are a wonderful repeating pattern contrasted by the light-dark of the snow-covered tree limbs reaching for the sky. Even the white picket fence, with the darker negative spaces, echoes the pattern. I finally took a moment to photograph Luna, a monumental stainless steel sculpture created by Gordon Reeve, artist and University of Manitoba Sculpture professor, and commissioned by Friesens. Having walked past Luna daily and at all hours, under sunlight, moonlight, and floodlight, I can attest to the validity of the description: “Luna looks as solid as a rock, but its rippled shape and variegated surface is designed to evoke memories of swaying crops and reflect light in endlessly different ways as sun gives way to shadow, and day to night.” Hopefully when I return May 5th, spring will have truly arrived, and scenes such as I photographed today will be just a memory. I’d like to introduce you to three of Friesens staff from the specialty packaging department: Jody Penner, Suzanne Klippenstein and Stan Bergen. Jody, Suzanne and Stan are showing the prototype of the linen-velvet presentation box for LABYRINTH SUBLIME. This prototype uses the same design as ANTARCTICA’s presentation box (as made by Keith Felton). Jody and Stan have been working on the design, testing strength, and sourcing materials for quite some time. This lovely prototype was hand-made by Suzanne. Indeed she’ll be the chief person to actually make all the speciality boxes for us. The FINAL prototype, custom fit to LABYRINTH SUBLIME, awaits specific measurements that can only be obtained from a finished bound book. Our production proof copies will be ready in about a month’s time. To clarify: all books will be sewn and bound by Felton Bookbinding in Georgetown, Ontario, and the boxes will be made by Friesens in Altona, Manitoba. Speaking of Felton Bookbinding .... Felton has taken delivery of the Chieftain leather imported from Scotland for our project as well as a couple advance sets of pages which we sent as soon as pages were available. Master binders Keith Felton, Chris Narayan and Wilhelm Albiez are now binding the production proofs in the same meticulous, laborious, and skilled manner as ANTARCTICA. Once these proofs are completed, we will carefully review every specification, make whatever adjustments that may be needed, and then give the go-ahead to bind the tomes! And finally, of the five brass dies engraved by Frank Bonigut for our project, tests showed that one required a few small changes so that Keith can deboss the design more deeply, and to satisfy our artistic eye (we requested a simplification). Frank is kindly making these changes right now. These dies are used to deboss the spine information on both the book and the presentation box; the big KEOUGH on the book cover; and tome’s title along with a labyrinth design which will appear on both the book’s cover and on the leather insert for the presentation box. Here’s a preview of the design of islands and waterways of the Inside Passage. This is actually a simplified drawing of an aerial photo we took over the Central Coast a few years back. We’re getting closer to completion every day!!!! But would you have believed how much work is involved? There is much more to come once we move along to the bindery.